A whole grain oatmeal is the best pick for breakfast. Oatmeal has rich antioxidant properties and helps repair damage done to your skin by pollution, UV rays and chemicals. Also it reduces itching and inflammation and can be used to calm eczema and heal psoriasis. Rich in proteins and lipids oatmeal has potent emollient properties making it a great moisturizer for your skin. One serving of these little fishes contains 1.5 grams of omega-3 fatty acids, which is one of the best sources of healthy fat. Fatty fish is essentially rich in Omega-3, an anti-inflammatory. Inflammation is now known as the root cause of acne. 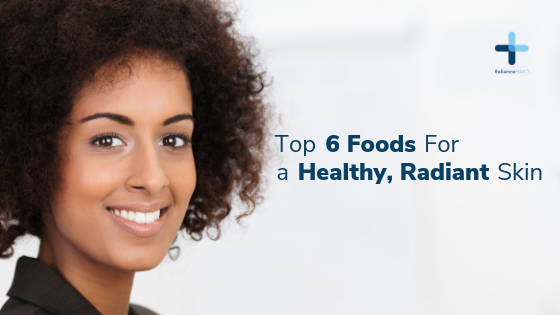 So packing your diet with these healthy fatty fishes can keep your skin clear. Surprisingly, water is one of the major foods that help your skin stay clear and staying hydrated makes it appear more fleshy and less wrinkled. Another reason to fill yourself up on water over other drinks is because it helps you save sugar. Sodas, juices, and sports drinks cause your skin major distress because of the sugars found in these drinks. High blood sugar level causes the skin to sag and wrinkle. Eggs offer a substantial dose of protein without fat and less fat is the best look for your skin. Higher fat diets are associated with aging skin. According to a study in the American Journal of Clinical Nutrition, a 17-gram increase in fat intake increased your odds of developing wrinkles by 28%. Protein helps repair cells that have suffered damage. Eggs, a complete source of protein, also contain biotin, an essential vitamin that protects against dry skin. People who eat a higher amount of carotenoid-containing fruits and vegetables, like carrots, have more yellow tones in their skin, giving them a glowing complexion that others view as looking healthier. So apparently, eating lots of carrots can give you a natural glow.